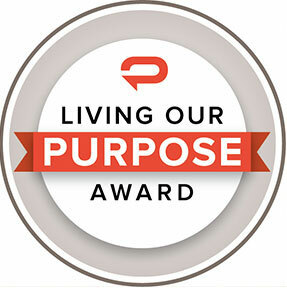 MINNEAPOLIS (October 27, 2016) – For the third consecutive year, Padilla has recognized employees who have made outstanding contributions to the agency in one of three categories – Client, Culture and Community – with the Living Our Purpose Awards. Each winner receives an award of appreciation and a cash stipend. An associate creative director in Padilla’s Creative and Digital Group, Thea Buri produces stunning creative deliverables for clients. Colleagues recognized Thea for her ability to solve business problems through design-centric thinking and to articulate design rationales effectively. She’s based in the agency’s Minneapolis office. Nicole Fischer, an account supervisor in Padilla’s Consumer Practice in New York, is known for the high quality of work she brings to all of her client accounts, across multiple industries, which include Coppertone and Prosciutto di Parma. Her professionalism and relentless enthusiasm are major assets to her clients and colleagues. Jeff Wilson, vice president in the agency’s Business Development and Agency Marketing Group, consistently goes the extra mile when it comes to spearheading new business and marketing initiatives for the agency. Colleagues recognized Jeff’s ability to easily work across the agency’s network of offices, as well as the numerous value-added contributions he brings to the agency. He works from Padilla’s Richmond office. Laura Krinke, senior account executive in the agency’s Environmental Science Practice, has helped shape the culture of Padilla’s Minneapolis office and the agency as a whole. While she works hard to support her clients, Laura’s colleagues also recognized her ability to bring people together in a positive and fun work environment. Gayle Kelly, director of operations in Padilla’s Richmond office, and Cheryl Robinson, director in the agency’s Corporate Practice and based in Los Angeles, were nominated jointly for their efforts in the agency’s annual Cookies for Kids’ Cancer Richmond City-Wide Bake Sale fundraiser. Gayle and Cheryl have been a crucial part of the fundraising effort since the beginning of Cookies for Kids’ Cancer in 2007, and they continue to dedicate an extraordinary amount of time and effort to the cause. Colleagues recognized Gayle and Cheryl for tirelessly working to raise funds and awareness for pediatric cancer and for truly making a difference in the community.